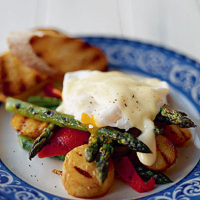 This colourful, warm salad combines asparagus, potatoes and peppers, and is topped with a soft poached egg. An ideal vegetarian supper. Boil the new potatoes for 10-15 minutes until just tender, drain and allow to cool slightly. Cut into thick slices. Combine 1 tablespoon of the oil with the paprika and add to the sliced potatoes. Toss gently to coat. Remove any woody stems from the asparagus by bending the bases. They will snap at the point where the woody part begins. Heat the remaining oil in a griddle or frying pan then add the spears in a single layer. Cook for 5-6 minutes, turning once, until lightly charred and tender (you may need to do this in 2 batches). Transfer to a bowl and keep the spears warm. Add the potato slices to the pan and griddle for 2 minutes on each side until lightly charred. Place in the bowl with the asparagus. Add the peppers to the pan and cook for 1-2 minutes to heat through. Tip into the bowl with the asparagus and potatoes and toss together gently. Pour boiling water into a clean frying pan and return to the boil. Reduce the heat to a gentle simmer, then crack 2 eggs at a time into the water and poach until the white is cooked through. Remove from the pan with a slotted spoon and drain on kitchen paper. Divide the asparagus salad between 4 plates. Top each with an egg and a tablespoon of Hollandaise sauce. Serve with slices of lightly toasted bread. Why not try serving with duck eggs instead of hen eggs. Their wonderfully large, yellow yolks are perfect for poaching.